It is no lie that my family is tech savvy, even the six year old has an I phone 4 (with no sim card). We love our electronics, but we are also HARD on our electronics. I was recently sent the Catalyst Waterproof iPhone case for review, when it arrived the family began to argue over who was going to test this contraption. At first David absolutely loved the case, and it is a well built case, but 24 hours into him having the case on his phone, he had to call home. He could make the phone call, but he sounded like a robot on the phone and I couldn't understand a thing he said - which was terrible because the truck would not start and he needed me to come to town. When he got home that night we took the case off, cleaned everything, and tried again for the next day - only it was an epic fail and his voice sounded more distorted - I am guessing the case did not fit his phone properly. I was not convinced this was a bad product, I knew as well built as it was, it had to work. I moved the Catalyst Case to D-man's Iphone 4 (with no sim card) and sent him on his way. The case was a success for D-man- he has had his Iphone at the beach, the splash park, in the yard, at rodeos, ball parks - you name it, it has gone. The sound issue was not a problem on his phone, now given he cannot make phone calls, however, he DOES have Voxer (a walkie talkie app) that requires him to use the microphone and it works perfect. D-man's Iphone visiting the local beach - resting on the picnic table. 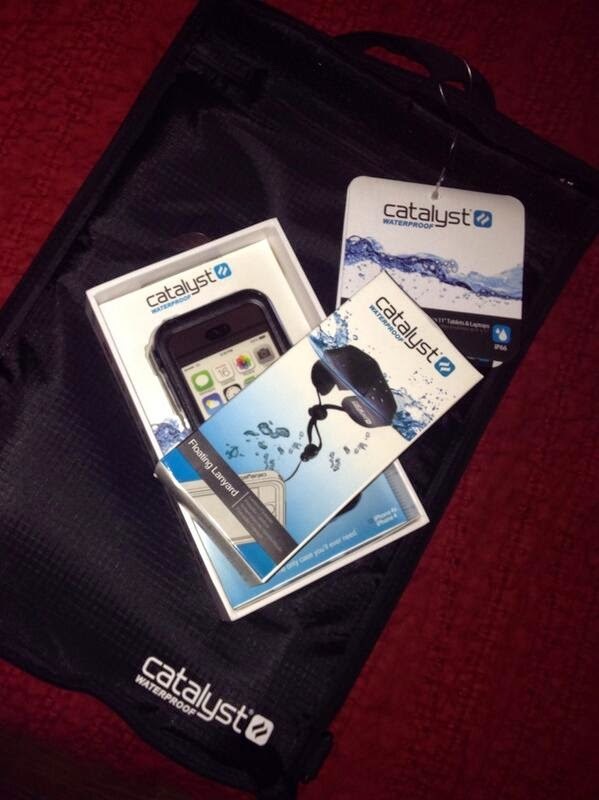 The Catalyst Case cost about $65 - which is right in line with the other life-proof cases. The extra bonus is you get a handy wrist band - which came in really handy with an accident prone 6 year old. Preserves all iPhone features including Touch ID, access to charging and headphone ports and True Sound Acoustics maintain high voice call quality even underwater! 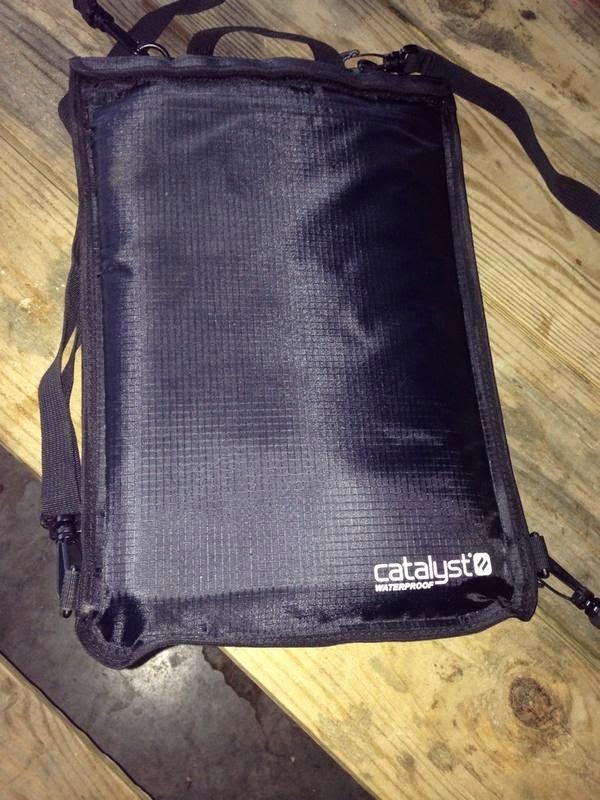 When sending my Catalyst Phone Case the company offered to send me a waterproof sleeve for my tablet - now everyone knows that I take my Chromebook everywhere - to the beach, fishing, ball games - pretty much everywhere I go. I gladly accepted the offer (who wouldn't) and am glad I did. Until this past week, I did not get a real chance to test out the waterproof bag - July means no rain, and even at the beach, I stay dry. It was a bright sunny afternoon, so the kids and I headed over to Whippoorwill Lake for the afternoon, I opted to pack my Chromebook so that I could work for a while. After an hour of being there, it began to cloud up and thunder - Ughh! I slide my Chromebook, my Iphone, and my car keys down in the bag, just in time for a heavy heavy downpour. Guess what? My Chromebook, my phone, and my car keys were nice and dry, but I was DRENCHED. Now any time my Chromebook leaves the house, as does my waterproof sleeve!